As briefly described in the post Writing on Trains, while taking my short excursion through Germany and Denmark, I was able to keep writing this blog mostly during the course of the various train journeys. 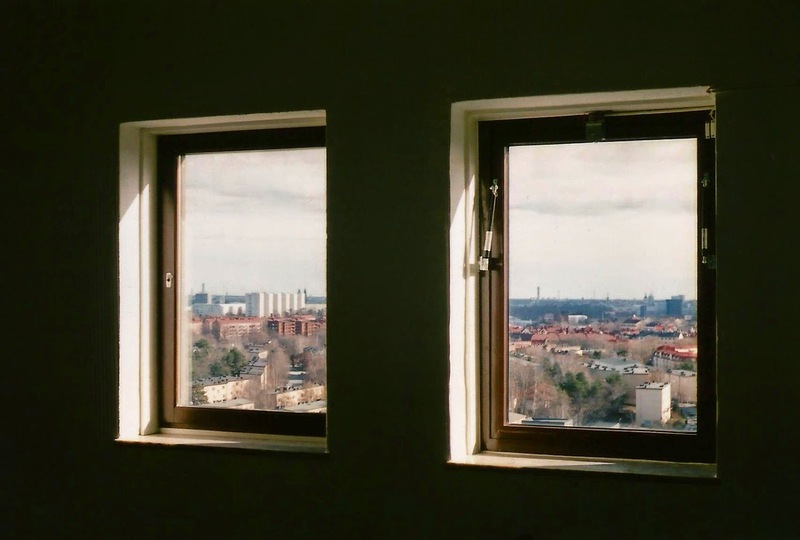 Now in Stockholm for over a week, being static there is no longer the same propulsion to write with the cascade of new impressions; instead, a different set of impressions is created, not through novelty but by repetitions of now familiar rhythms. Staying at Telefonplan, in the southern suburbs, the regular rhythms are the trains of the T14 Tunnelbana line - Stockholm's light rail system. Due to the landscape that the city is built upon, these trains frequently move from above ground to underground (as the name suggests) and back again. Directly outside the two windows of the room I am in, immediately parallel to the road this building is on, the railway line comes out of a cutting from Telefonplan station, bounded by a rocky outcrop on one side, and pass over a bridge crossing a road, before going into a tunnel into the hill bounding the horizon. This hill, with some apartment buildings among bare trees and some evergreens on the ridge, is just conceivably reminiscent of an Italian landscape, firs or pines standing in for cypresses, of the kind Northern European artists were seeking out in the late 18th and early 19th century (such as Thomas Jones or C. W. Eckersberg). This is the scene that I've drawn on two of the postcards. At different times of day, the trains' frequency changes, and during busy morning and early evening periods, the regular T-bana trains are joined by older rolling stock, announced by a slightly higher pitched whine. These blue trains have a near-generic look of many European cities' light rail trains, such as classic Paris Metro trains, older Berlin (or Hamburg) U-bahn trains - boxy, unstreamlined, with ridged metal panels, rounded corners to the narrow windows on the doors, individual seats, bare metal pillars and handles. Although there was snow on the first morning after my arrival, the weather has turned fine since and the passing of the day is figured by the changing direction of the sun harshly back-lighting the scene during the height of the day, throwing the rocks and concrete of the embankment into sharp relief during the evenings with a parallel direction to the road and railway. A series of flags outside provide a regular snapping sound of ropes against poles in the wind. The architecture at Telefonplan has an unadorned utility that is hard to date: large tall blocks of many floors with regular grids of windows, the brutal bare concrete tower that dominates the local skyline. Small details betray something of their age: the extensive use of terrazzo, for window sills as well as stairs, the small amount of wood in a few areas, and the tapered pillars outside. In the Spårvägsmuseet, Stockholm's transport museum, there was a display of photographs by Sven Goliath (1918-1989), which included a shot of Telefonplan from 1954, clearly showing the concrete tower and existing buildings very much as they are today. The whole complex which now includes offices, the art school, and accommodation and other services used to be the headquarters of Ericsson, and a bust of L. M. Ericsson stands on the corner diagonally opposite the station, next to one of the curious public telephones of the Rikstelefon with its odd flared lattice base. The main factory and office buildings were designed by Ture Wennerholm and built 1938-40; the 70 metre high tower was added after the Second World War, and designed by C. Dahl Steffensen. The tower is referred on the Swedish Wikipedia page about the Ericsson factory at Telefonplan to by the compound word kortvågsforskning, which translates as 'short-wave research' - this must be for microwave transmissions, the impetus behind the Kaknästornet written about under 'Panoramania'. The tower is not open to the public; however, opening a door at the end of a corridor on the top floor - the seventh floor - of the accommodation block, led into the adjoining building, into a stairwell that went as high as the 13th floor, halfway up the height of the Telefonplan tower opposite.